Rides disappear all the time. Some were classics that fans still mourn to this day. The Epcot double-decker bus, however, was not. In case you don’t remember, the double-decker buses were a motorized option around World Showcase for people who balked at walking a 1.2-mile loop. 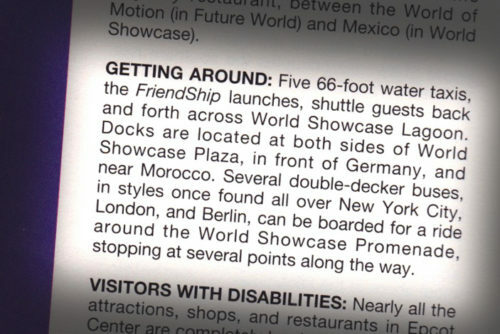 My old Birnbaum’s Guide from 1994 shows bus stops at Norway, Italy, France, and Canada. 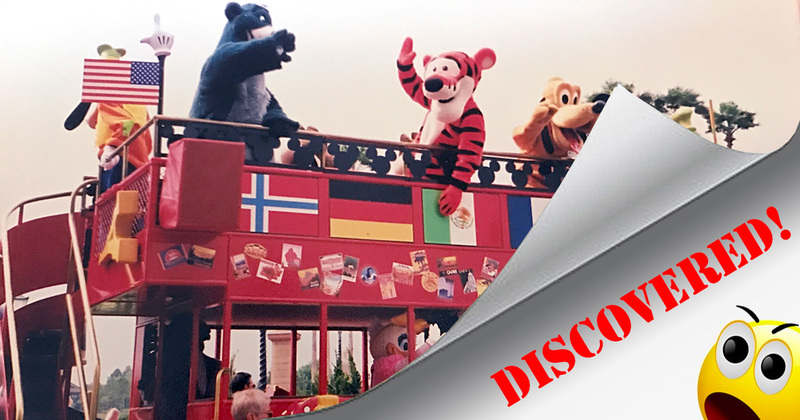 Was the Epcot double-decker bus an official ride or merely transportation? Had we invented WDW47 30 years ago, it would have been a tough call. By Epcot’s next decade, they had abandoned the transportation idea, opting instead for something called Characters on Holiday. All your favorites like Prince John and Geppetto would pack onto the bus like a roving band of tourists, making short stops for photos before piling back on to explore the next country. It was basically the character version of every cruise line shore excursion you’ve ever taken. It so happens that my sister is a former “friend of Meeko,” and she worked the character show on occasion. It’s the only reason why I have these pictures. As you can see, there wasn’t much to it. By the mid-2000s, Epcot had started finding more permanent locations for Disney characters. As World Showcase became more and more crowded with festival booths and actual tourists, they discontinued the Characters on Holiday show. Nobody cared. While the characters were fun, guests weren’t planning their day around Mr. Smee on the back of a double-decker bus. The buses became one more lost Walt Disney World memory. A few miles away from Walt Disney World lies a sleepy little former cow town whimsically called Kissimmee. It’s home to the 192 corridor — a strip of tourist traps and tacky souvenir shots ripped straight from the pages of Disney World’s 1970s heyday. But downtown Kissimmee hearkens back to an earlier time, before the Mouse arrived on the scene. It feels a land apart from the tourist areas just a few blocks away. The downtown area is a collection of charming shops and restaurants like the 3 Sisters Speakeasy. It’s also where I happen to go to church — which is why I found myself driving down Broadway at 9:30 on a Sunday morning. Parked in the lot across from the 3 Sisters was an old vehicle. 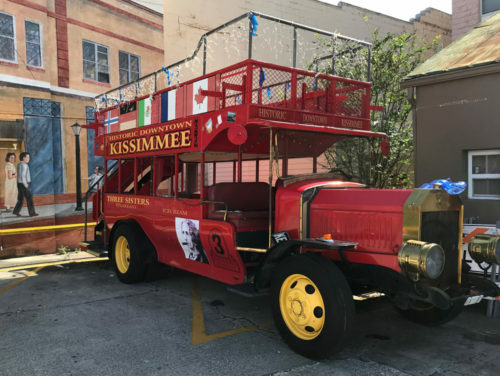 It was red, with HISTORIC DOWNTOWN KISSIMMEE emblazoned on the side. It also had the logo for the 3 Sisters and a big FOLLOW ME TO FOOD DRINKS FUN on the back. Obviously they use it as some kind of moving billboard. But more important than all that… It was a double-decker bus. I immediately hit the brakes. I’ve probably driven past it a few dozen times before and never thought anything of it. But it just so happens that I had included the Epcot double-decker bus as part of Parkeology’s 35 Freaky Flashbacks that very same day. It was fresh in my mind. It certainly looked familiar. An old-timey red bus with a stairway in the back leading to the upper deck. Up close, it did not appear especially well-maintained. There were no Mickey Glove hubcaps — just bare yellow wheels — but my son observed pockmarks in the panels, perhaps bolt-holes from comically oversized luggage ornaments once fastened to the side. An even greater giveaway was the array of plywood flags encircling the top deck — faded, but unmistakably the banners of Norway and Germany, Canada and Mexico. No question about it. 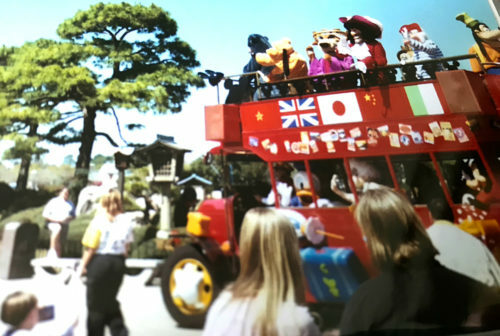 Here was the Epcot double-decker bus from Characters on Holiday. A little worse for wear, with some added stencil work and a strand of Christmas lights strung along the top rail. Yesterland listed the bus for sale way back in 2011. Apparently the 3 Sisters saw an offer they couldn’t refuse. I have no idea if they still drive the bus around Kissimmee today. The interior seemed pretty worn, with lots of exposed wiring and unfinished benches. In researching this post, I came across a Google Streetview of the Speakeasy, which clearly shows the bus parked in front, as if waiting for Brer Bear and Meeko to finish their meal. There’s nothing announcing this as a former Disney ride. Minus the World Showcase context, even the flags just look like generic decorations. But I did discover one small detail that sent a little chill up my spine. A simple stamp on the engine grill. A sign forever marking this as the Epcot double-decker bus. If you ever happen to find yourself in downtown Kissimmee, keep your eyes peeled for this lost piece of Disney World history. Parkeology began because we love exploring lost park history, wandering through ruins and seeking old relics like a geeky version of Indiana Jones. If you’re interested in some of our favorite obscure treasure hunts over the years, check out our discovery of the Sunset Ranch windmill, the doomed expedition to locate the Disney Institute Climbing Wall, and the unsolved mystery of the Sunken Island. This entry was posted in Lost and Abandoned Disney Details and tagged Characters on Holiday, Epcot, Omnibus, World Showcase. Bookmark the permalink. I was the Design Engineer on the, 3rd generation, Epcot Omnibus in 1983. It was a fun project. That’s pretty cool! So is this your handiwork or is this from a different generation of Omnibus? 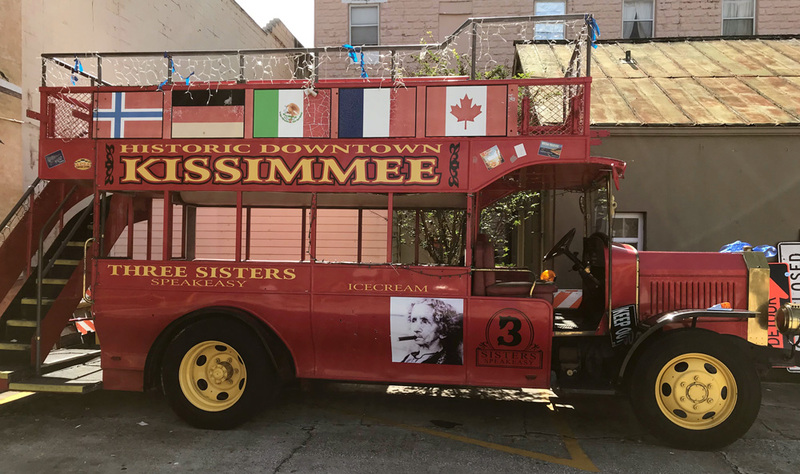 The Three Sisters Speakeasy does, in fact, use the bus during the annual Kissimmee Christmas Parade. And the bus does actually run independently. In order for the buses to qualify for the WDW47 challenge, they would need to be listed as an attraction by Disney. 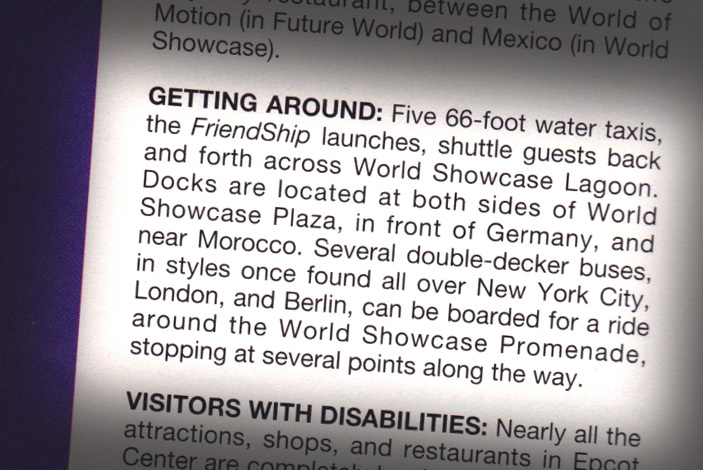 For example, the Friendships are classified as transportation, not attractions. But we would have loved to see teams racing for the double-decker buses! The Volo auto museum out here in Illionis also has a few Disney related vehicles including a more recent purchased Epcot Double Decker Bus that they recently refurbished. There’s one thing I find weird. One thing I found was a clue you didn’t bring up was the postcards beneath the flags. But checking the current picture against the old one, the postcards don’t match up. When the bus was redone, they painted over the old postcards and added new ones. That’s a really odd move, especially given how much father time has taken a bat to the flags. There should be one on the horn as well. That bus was called the Londoner and was originally bought from Disney by the Showcase of Citrus on Hwy 27 where they have monster truck rides. I’m familiar with Showcase of Citrus, but don’t remember them having the bus before. Thanks for the info! That is so cool! What a neat find. I remember when the bus used to open the park and then the characters would get off and greet Guests. We met quite a lot of characters that way. Good memory. They did use the bus at park open, distracting people with characters to keep the rides from being overwhelmed. Now that is a true parkeology find right there…..
It’s right up there with our favorite discoveries! I mean I’m sure there is stuff that you have found that you thought was huge at the time, but as the years have past those discoveries have faded into memory as just another discovery while other things that seemed cool but otherwise insignificant at the time have since grown in reverence…. Could be a fun post! We have a lot of material to choose from. I’m mentally checking off what I consider to be our favorite discoveries. Most of them still hold up! 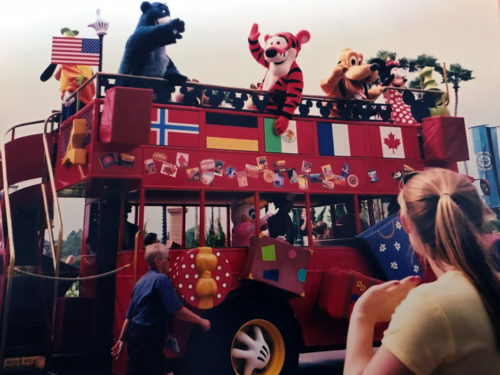 I remember the character bus show from Epcot! I actually gasped at the photo of the engine grille. A true Parkeology gem discovered. Not gonna lie, I got super excited when I found that emblem as well. Thanks!